Dreaming of driving to Alaska? Fantasizing about driving out there into the wilderness, surrounded by majestically wild scenery dotted with moose and the occasional Grizzly? Totally free and having the best time of your life? After all, that’s dozens of hours of driving time literally to the Last Frontier. With moose and Grizzly all around you! What if you run out of gas? What if your car breaks down? What if a giant brown bear eats you? Ok, let’s take a deep breath. The experience of a lifetime – for real. And I want you to take that awesome road trip too! 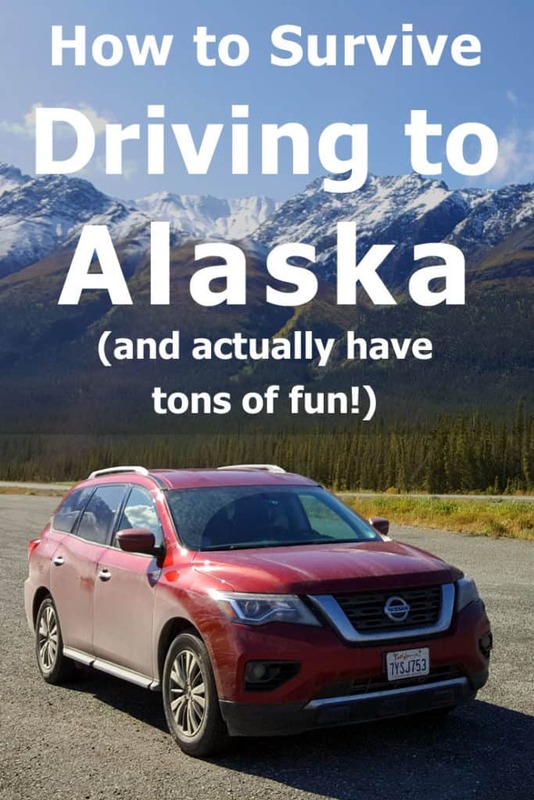 So in this post, I’m going to share with you everything that I’ve learned about the ultimate road trip – to Alaska and back. Learned by doing tons of research AND by taking the trip ourselves. And if you’re new to this blog and wonder who we are – check out this page. This post is long. I’m going to talk about a lot of things. We’ll start with an overview of the routes to Alaska (via Canada), then talk about the dangers of driving to Alaska and how to avoid (or mitigate them). That would include information about the type of vehicle you need, cell coverage and yes… bear safety. I’m also going to walk you through the technical stuff like passports and costs. Finally, we’ll talk about possible itineraries for driving to Alaska from various points of origin in the Lower 48. Oh, and I’ll share our drivelapse videos and photos too! Whew! Sounds like a lot to take in? It is! But then again, if you’re going to take the ultimate road trip to Alaska, you need to know what you’re doing (and exercise your patience muscles too – this is going to be a long road trip so you better be able to take in reading a long blog post 😉 ). Yes, I know, this is pretty obvious. 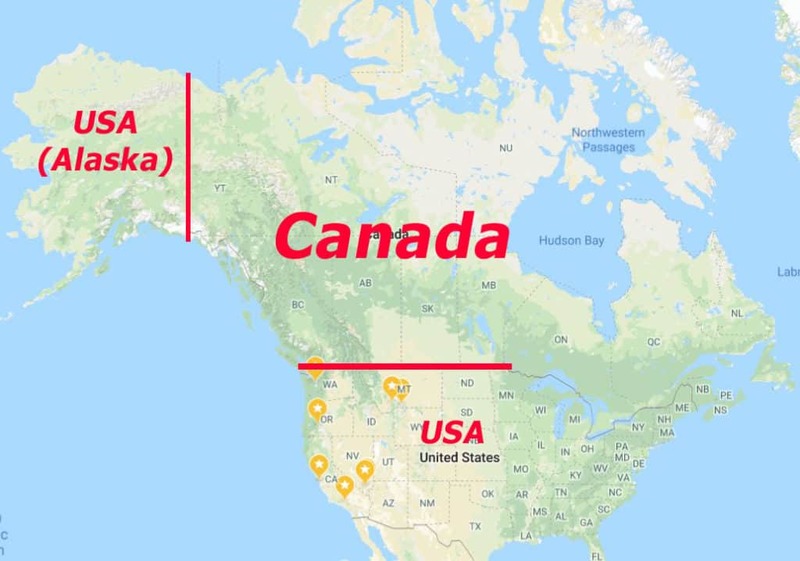 You just have to look at the map to see that there’s this HUGE chunk of Canada between the Lower 48 states and Alaska. Depending on where you’re driving from in the US, you could end up spending most of your trip in Canada. It really is that big. 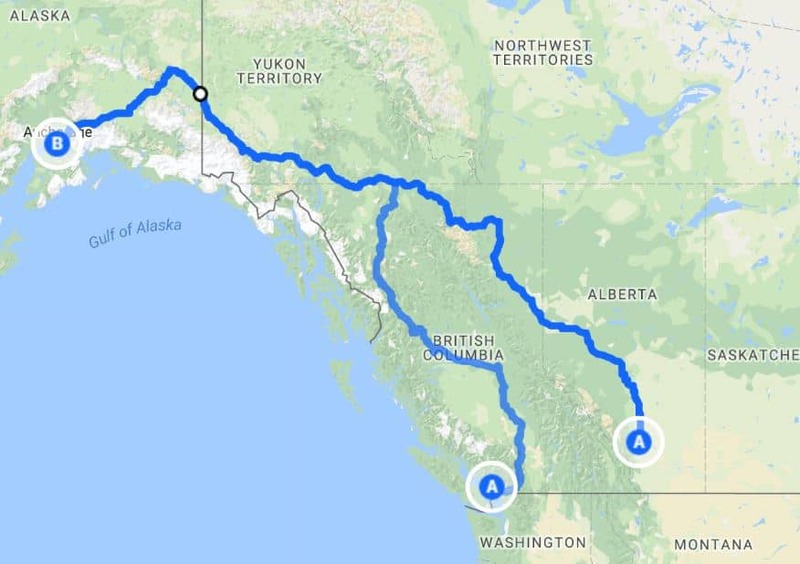 Your route is bound to take you through the Canadian province of British Columbia as well as the Yukon (which isn’t a province per se but a Canadian territory). Where does the route go through in Canada? The Alaska Highway via Dawson Creek. The Stewart-Cassiar Highway via Prince George. As you can see, the Stewart-Cassiar joins the Alaska Highway as you’re leaving British Columbia and entering the Yukon. You can choose one of the two routes between the southern Canada-US border and the Yukon Territory. Once in the Yukon, the roads converge into one. This is the main route from the Lower 48 into Alaska. The Highway begins at Dawson Creek, British Columbia and ends at Delta Junction, Alaska. The Alaskan Highway is paved in its entirety and open all year long. The Alaska Highway is legendary. Let me tell you the story of this Highway in a nutshell. Feel free to skip the short history lesson. I’m even going to use a different color font to help you skip. Let’s go back in time to the early 1940’s. Following the attack on Pearl Harbor, the US is now at war with Japan which puts Alaska under threat. Alaska is a faraway state, unreachable by land. That’s a problem when you have a war going on and you need to mobilize forces. You make a road. Fast. There’s this other large country right where you need your road to go. So, the Americans passed along a request to the Canadians, asking for their permission to get their army into Canada and start paving the road. The Canadians took their time debating the issue, so the US just went into Canada and began the works. Basically, by the time Canada said yes, the road had been under construction for several weeks. Building a road through northern Canada is a huge challenge. This was truly a heroic feat, as the Army Corps of Engineers worked between March and October 1942 to complete a road all the way between British Columbia and Alaska. Today the Alaska Highway is an established road, paved all along the route. 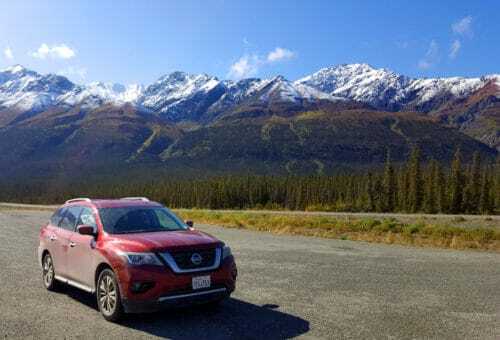 Driving the Alcan is still the ultimate road trip in North America, for its sheer length and the fact that it goes through a mostly empty country. Here’s a timelapse (or drivelapse) we shot of a section of the road between Junction 37 and Whitehorse. This is a short sample – about two minutes long. No sound. You can get a good gauge of the excellent road conditions on the Alcan, traffic density and also how quickly the weather keeps changing on a summer day (this was taken on August 12th). Should you drive the Stewart-Cassiar Highway on your way to Alaska? The traditional route to Alaska was along the entire Alaska Highway, from Dawson Creek in British Columbia to Alaska. In the map above, that’s the route on the right. The Stewart-Cassiar route on the left is relatively new. 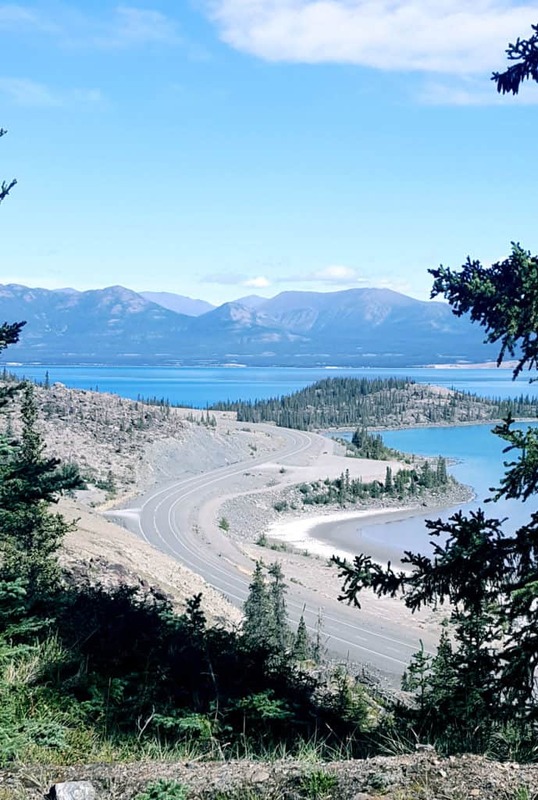 Also known as Highway 37, the Dease Lake Highway and the Stikine Highway, this road was established in the 1970’s and was not paved in its entirety until recent years. We drove the Stewart-Cassiar Highway in the summer of 2018. It was fully paved but also fairly narrow and curvy at parts. Take a look at this short drivelapse we made while driving the Stewart-Cassiar to Alaska. I included clips that show you how difficult it is to bypass other vehicles. Also, note the last section in the video where we had to drive on gravel. That actually happens on both roads occasionally – but clearly, this one is a narrower road. If you’re considering driving to Alaska via Highway 37, here are my pros and cons. This route is a little bit shorter saving you 120 miles (or 210 kilometers). The route takes you through a different and beautiful part of Canada. In terms of scenery, expect to see more mountains and green forests. You can take a short detour from the road for some bear watching in Hyder. The road is generally narrower (compared to the Alaska Highway) and has no shoulder in some parts. It can be harder to take over slow vehicles. If you ask me, both roads are worth traveling through. We did exactly that last summer and enjoyed both ways. The Cassiar is a gorgeous area and I’m not sorry we took the road less driven… That said, having visited once, I’m pretty sure our future drives to Alaska will be via the Alaska Highway just because it’s easier to drive and is probably a bit safer in that sense. Is driving to Alaska dangerous? Isn’t this a dangerous road trip? Yes, this is an adventure. We are road trip veterans (including traveling coast-to-coast three times via various routes). Driving to Alaska was by far the wildest of our road trips. There were risks along the way, yes, but we knew what we were going (or driving) into. We were as prepared as we could be, without going overboard with unnecessary measures. I want to help you be prepared and feel relaxed. This is what this blog post is all about. So let’s talk about the risks you could be facing while on the road, and how to avoid or mitigate those risks. Whether you follow the Stewart-Cassiar Highway or the Alcan all through, these roads need to be treated with respect. Both are fully paved and generally are kept in very good condition. When we were driving in August, we only encountered the famous frost heaves and potholes along a short section of the Alaska Highway, west of Whitehorse. But they were massive. Driving earlier in the season, you’re likely to come across more road issues. The harsh winter in these areas takes its toll on the asphalt and road repair takes time. There is also the danger of animals on the road. Many road sections are generally empty, with vehicles passing by sporadically, once every few minutes. That means animals – including large ones – see no problem with feeding on grass near the road, or even getting on the road. This is even more of a problem during cool days when the road can be warmer than the surrounding areas. Realizing that if anything were to happen – you’re on your own. There is no way for anyone to call 911. No cell coverage, no phones by the side of the road. You’ll have to wait for the next driver to see what happened and then drive on to look for help. And the nearest hospital could easily be a 10-hour drive from where you are. Crazy, I know. What can you do? I’ve put together a list of tips, based on our own experience and that of other travelers. Stay alert – don’t be lulled into a false sense of security just because you don’t see other vehicles on the road. If you’re getting tired, pull over and do what you need to freshen up. Slow down when you don’t have a good line of sight. If there’s a moose on the road around the next curve – will you be able to press the brake in time? If the answer is in the negative, then slow down. Watch for the orange flags on the side of the road. We found that the Canadians were really good at marking the large potholes by placing little flags on both sides of the road. When you see those flags – slow down and watch for potholes. Avoid driving in the dark. That’s when the road is truly empty and large animals are more likely to be on the road, enjoying the warmth of the asphalt. Dawn and Dusk are also riskier, so keep your eyes on the sides of the road and slow down. People really do hit moose in these areas. Often. Watch the weather forecast. Especially if you’re driving in spring or fall. There can be fresh snowfall on the highway as late as May and as early as late September. And if temperatures drop under the freezing point at night, the roads could be icy as well. Just drive safely. Don’t pass the vehicle in front of you unless it’s safe to do so. Even if it’s a slow RV. The main risk with this road trip is that of an accident on the road. Whether due to animals, the weather, potholes or just getting too tired and sleepy. Now that we’ve covered road accidents, let’s talk about the other challenges – and potential dangers – of driving to Alaska. At least, there is none along long stretches of the road north of Prince George or Dawson Creek. We couldn’t get a signal in many of the small settlements along the way either. We used AT&T with a plan that included Canada so that may have had something to do with that. They say that t-mobile is better for when you’re in Canada. Either way, don’t count on reception, especially not data reception, while on the Alaska Highway. This changes once you cross the border to Alaska by the way. We picked a signal pretty much as soon as we crossed into Alaska. We had coverage as good as – and sometimes better than – what we had in most US states. So what if your car breaks down? There are services along the road (at least during the summer months). If your car breaks down, you’ll have to hitch a ride with another motorist and get to the nearest town. You should be able to find a mechanic there who could drive you back to your vehicle, and either fix or tow it into their garage. It probably won’t be cheap because of the distance. Depending on how reliable your vehicle is, you may consider budgeting for an emergency like that. Unlike past years, you don’t need two or more spare tires to survive this road trip. One would be enough. Most new vehicle models have an extra tire. If that’s the case, you don’t have to bother looking for another full-size spare. Do I need a gun? If you’re an American driving from the Lower 48 to Alaska, you can bring your gun along and use it in Alaska. There’s some red tape involved and fees to be paid too. Here’s a link to the Canadian guide about bringing firearms across the border into Canada. We saw dozens of bears during our road trip to Alaska and back, most of them are Grizzly (or Brown Bear as they call them in Alaska). Not all of them were by the road. Some were in locations that we came to specifically to see the bear (namely, Hyder and Haines). The ones that were by the side of the road were totally harmless, of course. There is no risk to you in viewing a bear from within your vehicle. There is some risk to the bear though. I was reading an article in a local newspaper in Whitehorse (capital of the Yukon) about their bear problem. It was late August and the local authorities had already shot over 50 bears dead because said bears got into people’s backyards. Once a bear loses its fear of humans and begins looking for food where people live, there’s a real danger of an encounter turning into a bear attack. So, these bears must be put down before they end up hurting someone. According to the article, part of the problem was with tourists who were getting too close to the bear. Seeing a bear by the roadside, people not only stop to look but also get out of the vehicle and gradually get closer to the bear to get better photos. That’s how the bear becomes used to the presence of humans. That bear would be more likely to get into local neighborhoods to forage, having lost its natural fear of humans. Back to the bear spray. We visited Haines, AK, during our own Alaska trip. One of the reasons for going there was to see bear feeding off salmon in at Chilkoot Lake. And we did. At some point, a young Grizzly appeared on the bank across from us. For 15 minutes, that bear was jumping from one small island to another, taking out big fat salmon and stopping occasionally to munch on his prey. He kept island hopping and finally ended on our side of the river. He then proceeded to catch fish along the bank, moving towards us. At some point, he was under 20 feet away, happily keeping himself busy looking for fish in the water. He then lifted his face, looked at us (I swear he looked surprised!) and then moved on fishing and got past us. This was the most exciting bear viewing experience we ever had. And it was also scary. I was glad to have bear spray with me, and for the first and only time in our travels across North America, I actually took it out of the belt pouch. Here’s the video so you can see for yourself just how close that bear got to us. Now, the bear didn’t attack and all was well. Would the bear spray have helped us in case of an attack? Who knows. We do know how to use it and have gone through several bear safety lectures. Still scary. So, I’m not saying you should get bear spray but I’m also not saying you shouldn’t. I think at the very least it helped me feel more secure. Tip: You can carry bear spray across the border between Canada and the US but it must be labeled as bear spray. Don’t bring pepper spray that’s intended to be used on humans. What kind of vehicle do you need to drive to and in Alaska? Virtually ANY vehicle (as long as it’s in good condition) can make it to Alaska. You could drive around in a sedan, not a problem. The roads are good enough for that. There’s snow or ice on the road (4WD can really help there too, providing you with added traction). Is driving to Alaska hard? It’s mostly long. And awesome. The driving itself isn’t too difficult. Some sections of the road are winding and narrow – especially the part where you’re crossing the Canadian Rocky mountains – but it’s not any more difficult than any mountain driving in the west. In fact, some sections are surprisingly easy to drive. Well paved with more than one lane and very little traffic. Just switch to cruise control and stay alert for animals crossing the road. When is a good time in the year to drive to Alaska? As I mentioned earlier, the Alaska Highway is open throughout the year. If you absolutely have to, you could drive to Alaska in wintertime too. I would advise against it though. Winter driving to Alaska is not for the faint of heart or the inexperienced. Yes, the road is regularly cleared of snow but if you happen to be caught on the road when a blizzard hits, you’ll have to pull over and wait for hours – possibly longer – for the snow plowing vehicles to show up. Then you’ll have to follow them very slowly all the way to the next town. Let’s say your car breaks down on the road. During summertime, you’ll waste several hours and several hundreds of dollars but someone will come along and you won’t be in any actual danger. Winter? That’s an entirely different story. That’s when a problem with your car can be deadly if you don’t have a way to keep warm through the night while waiting for your rescue mission. What do you need for your trip? Driving to Alaska is a long road trip. There are 3,000 miles between Los Angeles and the border with Alaska. More like 4000 if you shoot for Fairbanks or Anchorage (and you will be – not much point in hitting the border and then returning). Los Angeles to New York City – the ultimate coast-to-coast road trip – that’s about 2,7000 miles. Driving to Alaska from most locations in the US can be almost double that distance. So, like I said, it’s a long road trip and you should pack accordingly. How many days does it take to drive from Los Angeles to Alaska? It’s taken us three weeks to cover the distance between Los Angeles and Fairbanks but we did take some scenic detours and stopped for sightseeing quite often. Total driving time according to Google Maps is 60 hours. If you were to drive 10 hours a day, you could make the distance in a week (allowing for some stops). And that clearly affects your packing. You need to take clothes, medications, and everything that you would need for a long while away from home. If – like us – you want to travel to Alaska for a while and then drive back – it all adds up. Three weeks on the way back. 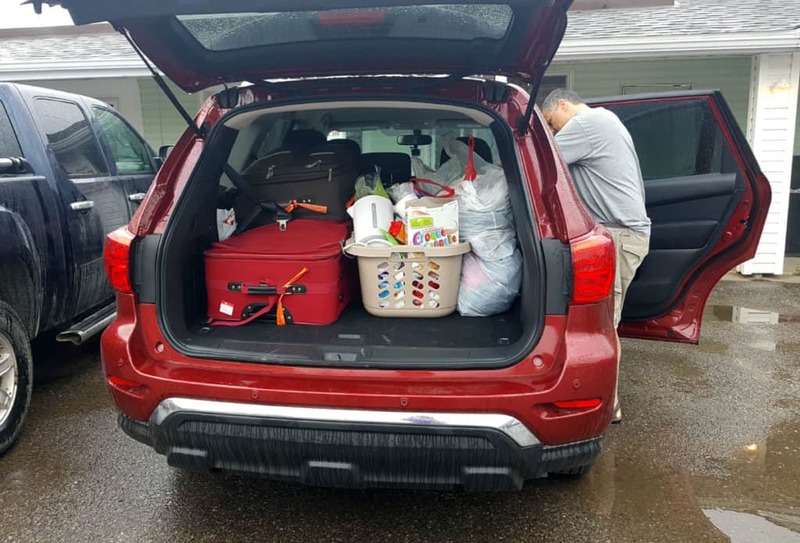 Your packing list should include everything that you need for the length of your stay and keep in mind that there will be days where you won’t be able to access a pharmacy or even a store larger than a gas station store. Once in Whitehorse in the Yukon, you can buy whatever you need. Clearly, you can do the same in Alaska. Keep in mind that prices go up the further up north you are, so it’s best to buy clothes, shoes etc in the Lower 48 and arrive prepared. Canada is a different country. When you cross the border, you are in fact crossing an international border. In my experience, both American and Canadian border police take their jobs very seriously. All vehicles are stopped for questioning and you need to present your papers. A passport book (i.e. a regular passport that gets stamped at international airports). A passport card – which is a valid passport only without pages in it. Americans can use that when crossing to Canada, Mexico, and a few other destinations but not for international air travel. A Nexus card – a special “trusted travelers” card that can be used for entering Canada. If you’re not a US citizen, you’ll need a passport to enter Canada or the US, so basically have your passports on hand whenever you cross the border – which could happen more often than you think. Do you need jerrycans of extra gas, another spare tire or motor repair equipment? A few decades ago, people did use to carry all of these along with them. The road was rougher back then with fewer services along the route. These days, it won’t take you longer than 200 miles to find another gas station on any stretch of road to Alaska. Just be sensible and top up when you hit the mid-tank mark and you should be just fine. What wildlife will I see on the way to Alaska? Oooh yeah, let’s get back to talking about the fun stuff! This is a FUN road trip to take, remember? The best times for animal spotting is early in the morning and late in the afternoon. Just please be careful as the animals can and do jump into the road unannounced. I almost hit a deer once in Idaho, so I know how a big animal can take you by surprise and just literally jump into the road out of nowhere. I’m extra careful because of that. Up in the north, we’re talking larger animals like moose which is even scarier. In fact, while we were driving the Glenn Highway in Alaska, a vehicle in front of us hit a moose and killed the animal on the spot. 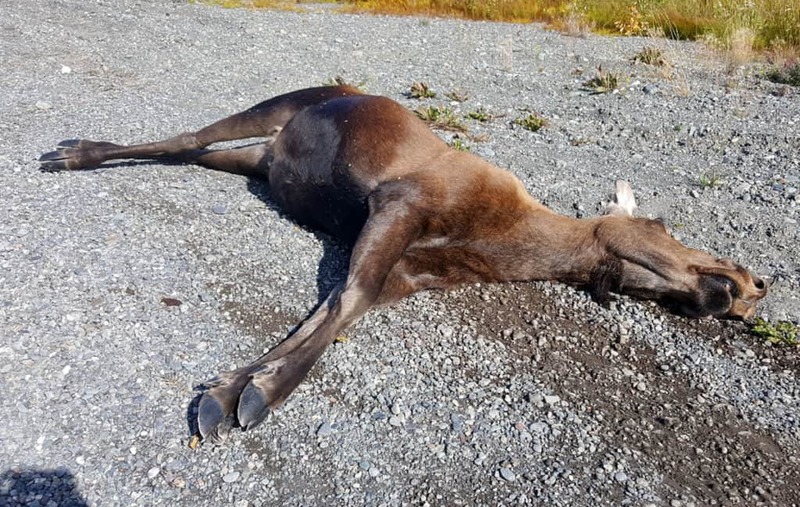 Fortunately for the humans involved, it was a young female moose and the driver managed to swerve so that only the animal’s head actually hit the vehicle. Also lucky for the humans was the fact this was a big Ford truck. 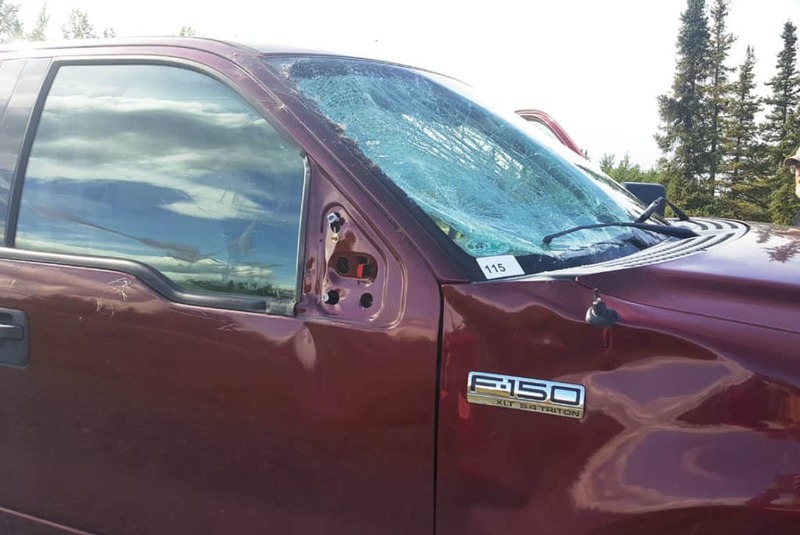 And still, just the head of a moose, on a large truck managed to do a lot of damage. The entire windshield was smashed, one mirror was off and there was damage done along the side of the truck. Be careful so you can view animals but not smash into them. How much does driving to Alaska actually cost? Look, there are no two ways about this. 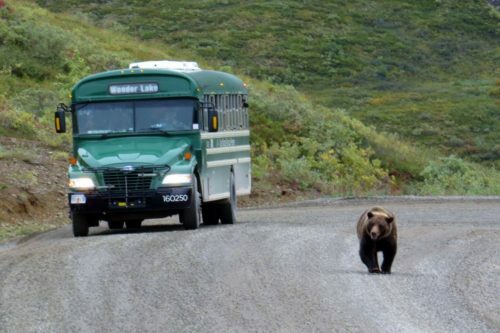 A trip to Alaska can be expensive. That includes arriving at the state and returning back home. I’m currently working on a huge blog post dealing just with the costs associated with visiting Alaska (not just getting there and back). Once it’s published, I’ll link to it from here. For now, let’s just say that generally speaking, gas costs more in Canada and price goes further up as you head into the remote areas of northern British Columbia and the Yukon. Expect to pay 25-50% more for gas. And remember, we’re talking roughly 3000-4000 miles in each direction so this can really add up. You’ll also need to budget for accommodation along the way. More on that in a bit, but for now let’s just say that we paid an average of $100-$120 a night along the route and that’s for a family of four in one room. Hotel/motel rates in Alaska itself are much higher. Expect to pay $150-$250 for a room in Alaska. Even more near Denali national park. Where to stay along the way? Towns like Whitehorse, Watson Lake or Fort Nelson. The towns are small. The largest one is Whitehorse and that has fewer than 30,000 residents. They all offer a selection of accommodation options, including motels and RV campgrounds. These towns have motels, including chain motels where you can get WiFi as well as other hotel amenities. Smaller points of human habitation are scattered along the road and they usually offer a place to stay for the night too. These are motels in the old sense of the word. Places for motorists to spend the night and move on in the morning. They’re not chain motels so don’t expect amenities like a gym, a pool or even WiFi. They don’t have that. Surprisingly, the prices aren’t super expensive. Whitehorse was the exception in that area with prices starting at the $140 range for a room for four. In all other places, we could easily find cheaper rooms. Should you book your room in advance? 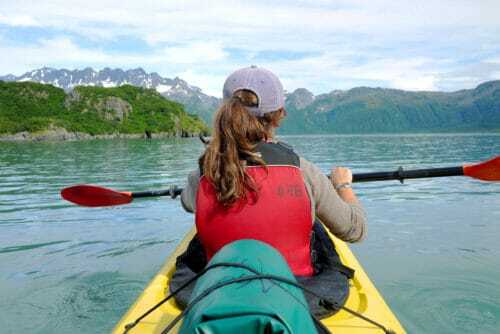 If you were to ask me about making hotel reservations in Alaska itself, I’d say “Go for it”. And be quick about it. Places fill up quickly and prices go up, so if you can book your Alaska accommodation in advance you could save yourself a nice chunk of money. Also, once in Alaska, the distances are actually not that bad and you have good cell coverage too. This makes it easier to plan ahead and also to make changes along the way. As for the part of driving to Alaska, it’s more complicated. Some of these places don’t have internet and they certainly don’t show up on sites like Booking.com. You can make reservations by calling them but I don’t think you should. First, these places rely on travelers dropping in unannounced, sometime in the late afternoon. Which means they usually have available rooms if you don’t show up too late. Secondly – and more importantly – it’s hard to tell how much driving you’re going to end up doing in any single day. And with no cell coverage, it’s going to be difficult to cancel and make changes along the way. You could end up stopping too early in the day just because you had made reservations in a certain location. You could be forced to drive on to get to a previously booked room. Which could mean driving when you’re tired and/or in the dark. Which is why I wouldn’t make reservations for that section of your trip. On our own journey, I only made reservations ahead of time for Whitehorse and that was because we stopped there for four days. For that length of time, I wanted to reserve a good room for us well in advance so we don’t spend too much on expensive rooms. Everywhere else, we just stopped for the night wherever we felt like we had enough. You do need to plan ahead. Look up the various places where you can stop for the night and know where they are. Otherwise, you could be facing a long stretch of the road before you reach a possible stopping point. I charted our route in a way that we always reached a small town in the afternoon. We didn’t stop there every time but at least we had the option to do that. With that in mind, let’s talk about one last thing before I offer you detailed itineraries for driving to Alaska: The Milepost. Just a quick shoutout first to two posts about accommodations in Alaska itself: Cheap(ish) hotels in Fairbanks and Anchorage hotels with pools. Assuming you’ll be spending time in Alaska itself, I thought they might come in handy. Should you be getting The Milepost? You could say it’s a book. But it’s also an icon. Some people the bible of driving to Alaska. This is a printed Alaska travel planner that specializes in driving to and from Alaska. 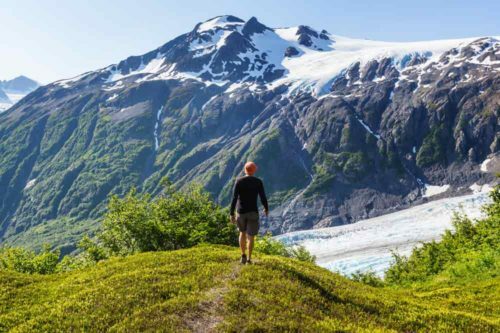 This guide offers super detailed descriptions for every part of every road that can take you from the Lower 48 to Alaska. And then some more. I had been wondering whether or not we should buy the Milepost. It’s available via Amazon so easy enough to buy but with overseas shipping cost, the expense was close to $50. However, this is one big book. These days with a small kindle holding an almost infinite number of books, should we still be buying thick printed books? Isn’t that too heavy and cumbersome? And isn’t all of the information available on the internet anyway? Eventually, I ordered our copy. It was worth every cent and every ounce of weight. On a very practical level, this was an invaluable resource for planning and executing our road trip. The Milepost offers lengthy discussions of the various routes and then provides a detailed description of every section of every road, to Alaska and in Alaska too. To be honest, in Alaska itself, where we had good cell coverage, I didn’t use the book very much. It really proved its value on the Alaska Highway as well as the Stewart-Cassiar Highway. With no cell coverage and no internet, this was our only source of information. We could plan ahead and see where we could stop for lunch, to buy groceries or stay the night. And it never failed us – the information was always accurate. And we discovered another fun use for the Milepost! Driving along for hours with no internet, what do you do? Every now and again, I would open the book, find the section describing the area and read it out loud to the rest of the gang. My kids were amazed to see that there’s something like Wikipedia – without an internet connection! So, yeah, get the Milepost! Whew, this is a long post, isn’t it? I hope you made it thus far. Now comes the fun part (for me at least). And this is a part where you can absolutely skip ahead, depending on where you’re driving to Alaska from. What I’m about to suggest are itineraries from your point of origin to the beginning of the Alaska Highway. Once on the Alaska Highway, it’s basically the same itinerary, so I won’t go into detail there. Do read my post about what to see and do along the Alaska Highway. What you’ll find there is not only a list of places to see along the road but also our own trip report of what we did while driving the Alcan in 2017. These routes all end at Delta Junction, AK. That’s where the Alaska Highway ends and where you can choose whether to visit Fairbanks or go see Anchorage and the area first. These itineraries are super flexible. I’m assuming that your goal is to travel to Alaska and enjoy the road trip to Alaska. Which means you’re going to pass some pretty awesome places en route without giving them nearly enough time – if at all. That doesn’t mean I think this is the right way to appreciate these areas. Far from it. If you have the time and the inclination, by all means, make longer stops and enjoy places along the way for longer. 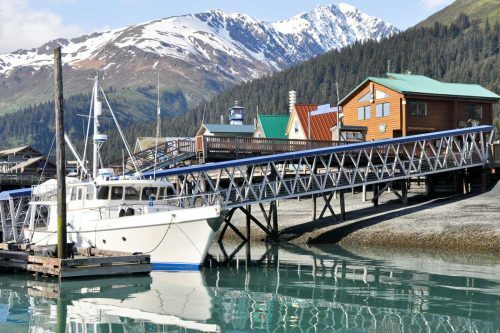 These itineraries are basically suggested routes that you can elaborate on to create your own Alaska Road Trip. Seattle is the large American city nearest to the border with British Columbia. If you’re flying in from overseas and wish to focus on a road trip from the Lower 48 to Alaska, Seattle should be your point of origin. Fly into SeaTac airport and rent a vehicle there to start your journey. Drive to Hope, British Columbia (3-4 hours) and visit the Othello Tunnels. Take it easy on this day as you have your first border crossing here. Continue on your way and stop at Smithers to hike to Twin Falls. Then go see Moricetown Canyon viewpoint further down Highway 16. It’s beautiful and if you arrive in August – like we did – you’ll get to see lots of salmon there. Daily driving time by this point should be would be 5-6 hours. Depending on whether you hikes or not, you can either spend the night at New Hazelton or push on all the way to Stewart which is your next destination. Driving from Prince George to Stewart in a day would mean 9-10 hours of driving. Arrive at Stewart and go see the bears at Hyder. Spend the night in Stewart and take your time with the bears. They usually show up early in the morning and then again in the late afternoon so give it time and be patient. Get back on Highway 37 and keep driving north. You can stop on the way at Dease Lake (great little grocery store!) and Jade City (basically a large store of local jade). Finally, you reach Junction 37 which is where you join the Alaska Highway. You can find accommodation in the hamlet of Nugget City which would put you at a total of 11-12 driving hours for this day. Drive west on the Alcan. Rancheria Falls make for a lovely stop as does the town of Teslin (we really enjoyed the local George Johnston museum!). Then continue driving to the capital of the Yukon – Whitehorse. Whitehorse is well worth stopping for at least one full day. We spent four days here and were never bored. 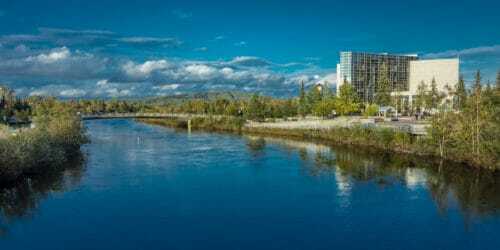 Here’s a list of things to do in Whitehorse. This day is dedicated to driving through – and visiting – Kluane National Park in Canada. Stunning scenery and you should include a short hike or two. Stop at the Visitor Center at Haines Junction where they can help you make the most of your time in the park. Even so, you can definitely make it all the way into Alaska on this day. Totally driving time to Delta Junction from Whitehorse is 9-10 hours. 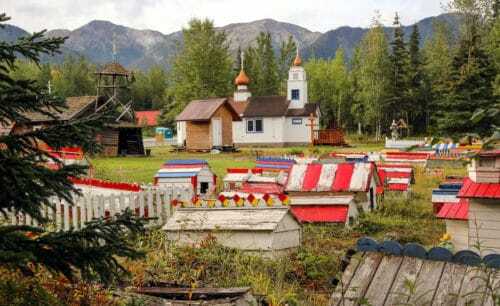 Or you could overnight at Tok, AK if you prefer to stop earlier. If you’re only driving one way and prefer to drive the Alaska Highway, you definitely can. It doesn’t even add too much driving time. For more information on these stops see my post on what to see and do along the Alaska Highway. Drive up the coast to get to Seattle and then follow the itinerary detailed above for driving to Alaska from Seattle. Head out east and go up the Rocky Mountains ridge. We did both during our last trip. We drove up north via the Rockies and then returned via the coast. The shortest route is via the I-5. This is the main highway connecting the west coast state. It’s easy to drive and fast and you actually get some very nice scenery in northern California and southern Oregon. Total driving time is 18-20 hours, so you should be able to complete this section within a couple of days. If you have more time, you can choose an alternative – and far more scenic routes. You could take the mountain route, taking in Sequoia National Park, Yosemite, Lake Tahoe, Lassen National Park, Crater Lake, Bend and the northern cascades including Rainier National park. Your total driving time will be in the 30 hours range but with so much to see and do, you should give this route a minimum of one week, preferably even longer. Driving from Los Angeles to the starting point of the Alaska Highway doesn’t have to be through Seattle or the coast. In fact, the shortest route is quite special too, taking you through the empty spaces of Nevada, Utah, Wyoming, and Montana. That’s what we did in August 2017 and it was a pretty awesome route. I loved how these areas have so much open space. It’s a great prelude for the wilderness which surrounds the Alaska Highway. 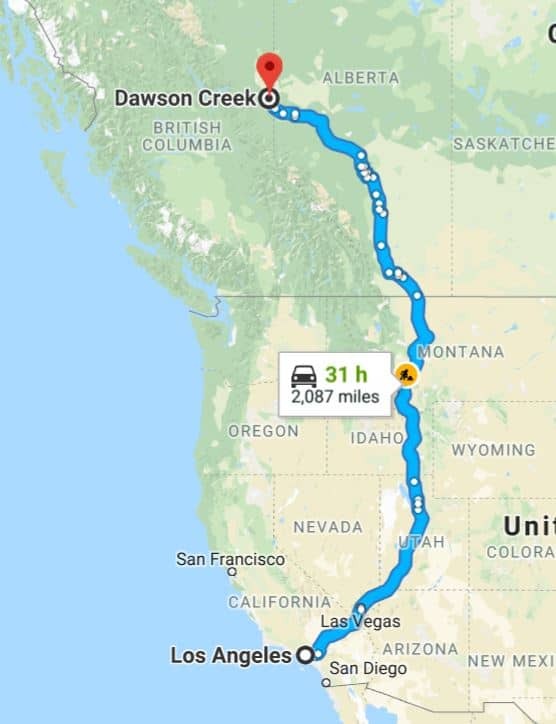 Driving straight from LA to Dawson Creek takes roughly 35 hours (Google Maps tends to be too optimistic, so I always add 10% to their estimates). Again, this route has some awesome places you could spend several days visiting – each. You could easily take small detours to drive through Yellowstone National Park and even the Going To The Sun road in Glacier National Park. And if you have just a couple of days to spare, do just that! Of course, once in Canada, you’re going through the Canadian Rockies – totally worth adding a few more days to your trip. Our stop at the Canadian Rockies was totally worth it! If you take these detours, driving time alone will come to almost 50 hours. That’s why writing the skeleton for this itinerary is really hard for me. So, I’ve added suggestions for spending extra days in more than one location along the route. Give yourself time. While you could technically do this in 4-5 days, you should really give it at least one full week. 10 days to two weeks would be fantastic. Los Angeles to Salt Lake City (Yes, Las Vegas is on the way so you can break this into two days for an evening in Vegas). Yellowstone National Park – At the very least, drive through the park, stop to see Old Faithful erupt, drive through Hyden Valley and take a see Yellowstone Canyon. See this post for top 10 things to see in Yellowstone. Definitely add a day or two here if you can. Drive from Yellowstone to the eastern side of Glacier National Park. If you have time – drive into the Mani Glacier area as you arrive. Check the roadside for bears – lots of them in this park! More on what to do in Glacier National Park. If you enjoy hiking, definitely add a day to take a long hike in the Mani Glacier area. Drive the Going to the Sun Road in Glacier and continue to Canada via Kootenay National Park. You could make it all the way to Banff today, or spend more time in Glacier and stop earlier. Banff National Park – definitely worth adding a couple of days here! 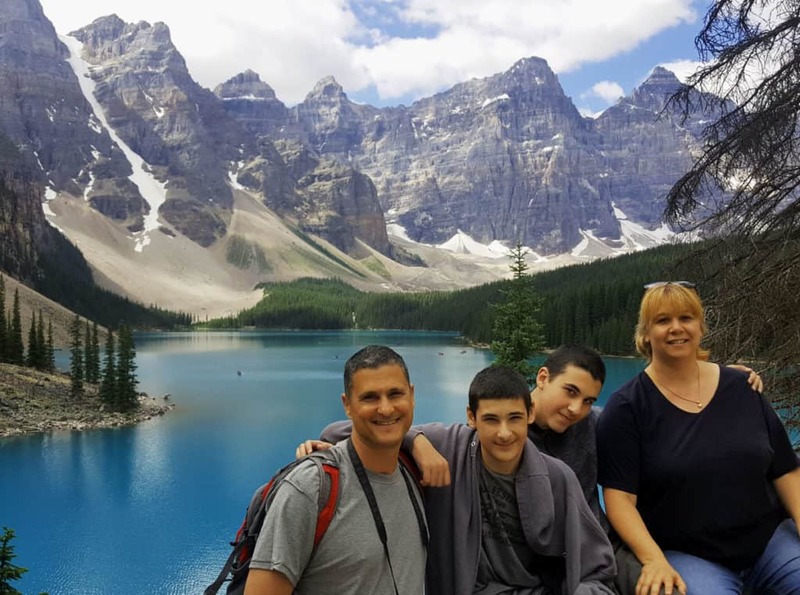 Read about the four natural wonders in Banff if you don’t believe me. Or you could keep on driving along the amazing Icefields Parkway to Jasper. Finish the drive from Jasper to Dawson Creek. You’ll be leaving the mountains for the plains, making for an easier (if not as pretty) drive. Well, you’re in for a long drive! Totally doable though. I’m going to assume that you’re not about to do any sightseeing out east. Gettysburg or Cuyahoga are easily accessible at any other time. You’re going west, young person, right? That’s why I’m assuming that if you’re heading out of NYC, you’re going to take the i-80/i-90 route to Chicago. The shortest route between NYC and Dawson Creek – the starting point of the Alaska Highway – will take you through the Canadian province of Saskatchewan. You’re basically driving from one big American city to another all the way to North Dakota and then crossing over to Canada where your route takes you through two local Canadian cities – Saskatoon and Edmonton – directly to Dawson Creek. 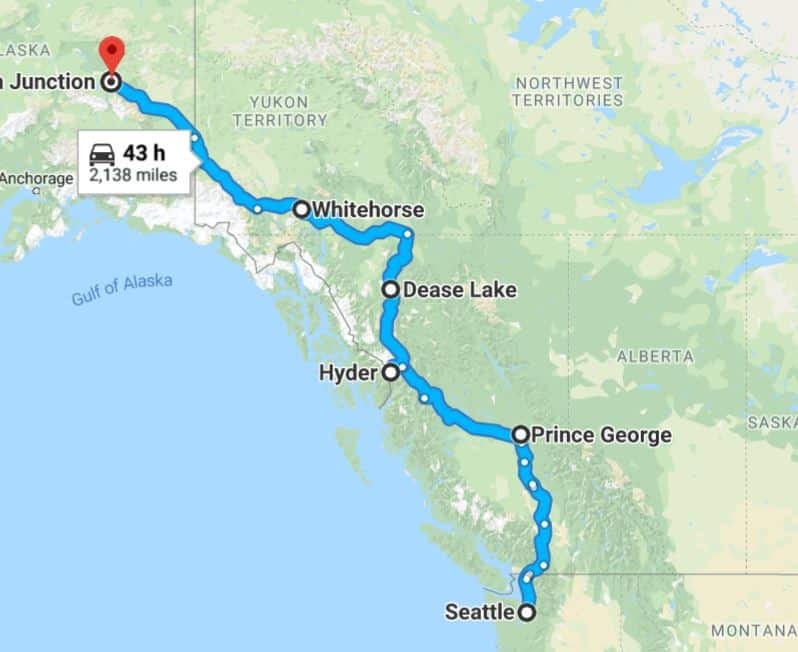 It’s a total of 45-50 hours of driving so you should be able to just drive the distance in 3-5 days and get on the Alaska Highway. However, if you have an additional week and you want to make more out of your time in the west, I would suggest taking the longer route and driving through Roosevelt National Park in North Dakota and then Glacier National Park. Roosevelt National Park is well worth a day’s visit and so few people get to see it. That’s where we saw not only bison but also more than one herd of wild mustang horses! Glacier National Park, well, probably the most beautiful of all American national parks. 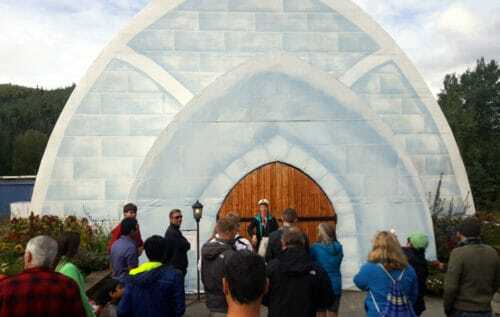 Check out my post about the glacier and see our photos from the park to judge for yourself. And then you have the amazing Canadian Rockies. If you’ve never been to these places and you’re traveling on your ultimate once-in-a-lifetime road trip to Alaska and back from New York, I say, add a week and visit them too. Drive the Icefields Highway to Jasper and visit Jasper National Park (Yes, red again – take another day to appreciate Jasper NP if you can). 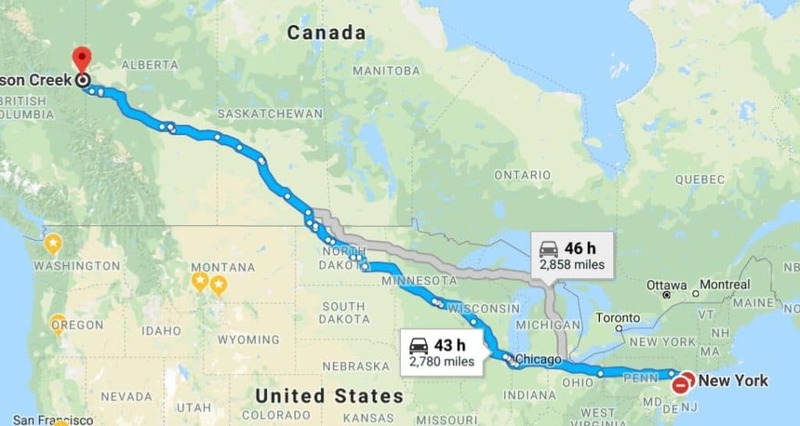 So we’re talking at least nine days for this route of driving to Alaska from New York. If you can make it a couple of weeks, you’ll be able to slow down more often and appreciate the stunning places you’ll be visiting. Woha, you do realize you’ll be driving the entire stretch of the map? Probably the longest possible road trip in North America. Since I’m not entirely sure there’s anyone as crazy as us out there, I won’t be adding an itinerary here. I’ll just say that if you’ve never been out west, make your route go through Yellowstone, Glacier and the Canadian Rockies. That’s going to put 10 additional hours on your driving time but will be so worth it. Show of hands, who’s still reading? This is officially the longest post I have ever written in my life. Seriously, leave me a comment and let me know if this helped and if you have any other questions about Driving to Alaska. I always reply to comments and would love to share more information based on our vast experience road tripping across the US and Canada – including driving to Alaska and back. It’s taken me several days to write this post, so if you could lend me a hand in getting it out there, I would really appreciate it. Share it on Facebook or Pinterest, or if you’re a travel blogger, mention it on your blog. Thanks in advance! Oh, and before you head out, check my 37 road tripping tips (based on more than a year and half of amazing road trips in the US and Canada! We loved reading your trip details- you should write/sell a book! Thank you so much for taking all the time to post.We have driven to Alaska in a camper twice ( from Iowa) but have not taken the Cassiar Highway. We will be going May 11. 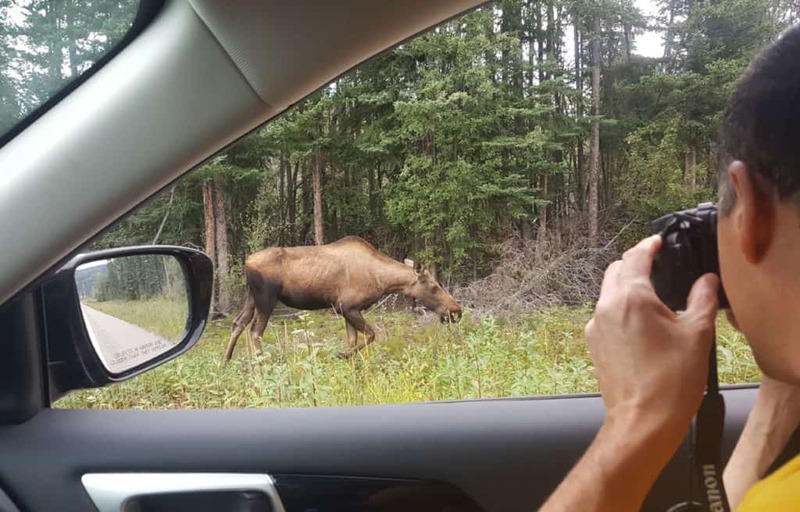 Our big question, and it looks like you will be able to answer candidly, where do you think we will see more wildlife- Cassiar or Alaskan Highway? So glad you enjoyed the post! I am actually toying with the idea of writing an e-book about the experience. Sounds like you could write your own book too! Driving the Cassiar later in the season (maybe on your way back?) you can stop at Hyder. From mid-July till September, if you stop for a full day and spend either early morning or late, you’re pretty much guaranteed great bear viewing. They’re still closed in May though I thought I’d mention it in case you’re considering driving back later in the summer. Other than that, animal sightings require some luck! We’ve seen roadside bears on the Cassiar and on the section of the Alaskan Highway that’s further up north from Whitehorse (i.e. the one both roads merge into). We’ve seen the wood bison on the Alaskan Highway and I understand they’re pretty much a regular feature there. We didn’t actually see moose on either route – only in Alaska itself. So, overall, I don’t think one road offers more animal sightings than the other. I would definitely check road conditions on the Cassiar Highway before making the final decision. I have a feeling they may be slower to fix that road when spring hits, just because the Alaska Highway is the commercial route for trucks. Good luck! Yes, I kept reading though given that we are coming from northern California I skipped the irrelevant parts like Miami routes. Very thorough and well thought out. Thank you for the effort! The lack of cellphone coverage will scare the dickens out of my wife. She just revealed that while we were driving through New Hampshire from Vermont to Maine, she got scared as evening was coming on, the road was lonely, and we had no service (plus got mildly lost after missing a turn). On the upside, I’m guessing there is very little way to get lost on that highway! Navigating the route is definitely easy. I can relate to your wife’s concern. We’ve traveled through many long and lonely stretches of roads in the US without cell reception though. The overall distance is longer across the Alcan but there’s actually more traffic than you’d be seeing on some roads in Montana, North Dakota or Nevada. I hope you make the trip – enjoy the adventure and stay safe! Can you give an idea of how mountainous these two routes are? I will be driving a Honda Odyssey and towing a small camper trailer. Steep climbs and descents would be a problem for my rig. There were sections of the road with inclines on both routes, I remember as much, but nothing too dramatic in terms of the West (we’ve driven pretty much through all the big mountain passes in previous trips). However, we traveled in an SUV and without towing anything so that probably was super easy on our vehicle. I’m not sure what the towing capacity for a Honda Odyssey is or what your trailer weighs so I can’t say if these would be an issue for you. I hope this helps. Wow, sounds like quite the adventure! Huge trucks frequently go on the Alaska Highway, so I doubt you’ll have any issue with bridges. I’m no expert on weapons but from what I’ve Googled concealed weapons are not allowed in Canada in general, so my guess is you can’t conceal the weapon. From what I’m reading, you can take your gun through Canada but there are forms to be filled in at the border crossings. Maybe look for gun owner forums and ask there? 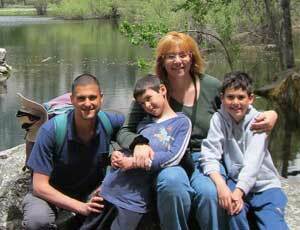 We did a brief trip into Canada a few years ago with family members who both have CCWs. Rather than fuss with the handguns, we left them back in the US and just did day trips across the boarder. The relatives said Canada was more accepting of long guns than hand guns and so they didn’t want to fuss with it. We were traveling in a motor home at the time, so just unhooked the towable and used that. Hi Pat! You really made my day with your comment! So glad you’re going to be driving to Alaska – stay safe and have tons of fun! You have given a great account of every possible “adventure”, good and bad, for the journey. After reading your post I feel like I have made the trip. We plan to fly to British Columbia from VA, rent an RV and take the Highway. Tossed around the idea of a cruise but don’t want to be that confined to an itinerary, we’re more freelancers. Thanks so much for the advice and safe travels. Hi Helen, thanks so much for leaving me such a kind comment! So glad this helps and safe travels to you too! By the way, I have a new blog about RV’s here. I wrote about renting RV’s there as well. RV’ing is next on our list of things to do (planning on buying a 5th wheel at some point), so I’m researching the topic in depth. Great website and info. Planning to go summer 2020, after retirement. Talking this up, I’ve got 3 vehicles now going…2 I can depend on, and a neighbor that’s a little hard to pin down. Other truck camper owner is my college buddy now living in the Bay Area, we are originally from Maine. your blog is informative and inspiring, Thank You ! Sounds like a cool adventure! IMO, as long as you’re not going during winter, you shouldn’t have a problem driving without company in tow. But having friends along is more fun, for sure. We are in the beginning stages of even “thinking” about driving to Alaska when we came upon your blog. Thanks for this. We too, want to travel with our dog; however, will have to research Canada’s restrictions/requirements prior to. We know Denali allows pets, but not on any trails, just the roads and bike paths. I am still researching pet friendly hotels in the area. We are also contemplating taking our travel trailer with us…Thanks for this blog as I now know there IS a Highway that is open year-round to Alaska, I didn’t know this before. Yup, the Alaska Highway is open year-round, but it could get blocked by snow in winter time. I talked to a friend who used to live in Fort Nelson and he said they plow the road within hours. Definitely not a good situation to be stuck in if you’re in a car though, especially at night. I imagine a travel trailer, stocked up with enough fuel for the generator would be ok though. Would need a four-season rig too, just for the added insulation as these areas are so cold during winter! Good luck with your trip – sounds like you’ll be going on a real adventure! Thank you for all the great information, tips & pics. We must be crazier (or as crazy?!?!?) – we plan to drive from Daytona Beach, FL to Alaska this year. We will be camping in a 5th wheel the entire time. Yes – crazy! I think it’s an awesome plan! That’s actually my retirement plan – to buy a 5th wheel in the US and travel all over, possibly from Florida to Alaska too! Enjoy your travels! Sounds good. I would take two or three weeks to do that. Check out my Alaska Bucket List post to see my favorite spots. Yes..I read the whole article. Even viewed the videos. Very interesting and useful. 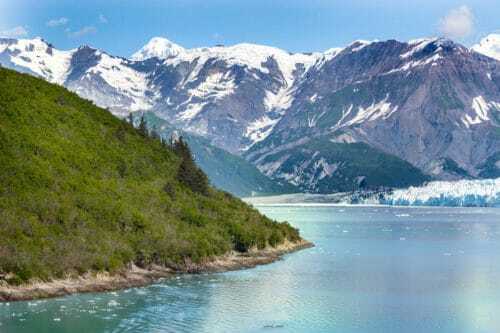 My goal is to travel to Alaska the Spring/Summer of 2019. I’m in the process of purchasing a new truck (my Silverado has over 310,000 miles) and putting in a slide-in camper. As my plans are for camping, fishing and gold panning in Alaska. I need to research more info regarding camping through Canada. You didn’t get into it much. Also, I’m bringing my dog, so will read up on requirements for crossing the border with a pet. Otherwise, I’m preparing for the trip a lone with my dog. I want to be around to enjoy the northern lights too and I’ve heard they’re better at certain times of the year. I have all the time I’ll ever need….Alaska is my final state to visit. (Can’t drive to HI so I’ll never go) Thanks for all the useful information. Alaska tourism sent me some great maps and information on places to visit. The GPAA has gold claims where I can camp and pan. I’ll check out a gun show to purchase a handgun. My CC permit covers me in Alaska. I’m totally ready for my best adventure yet. Pen and paper and camera ready. That sounds absolutely amazing, Phyllis! We did get to see the Northern Lights on our trip, and it was actually in Canada, en route from Alaska. I have a post about the best times to view the Aurora in Alaska, including our own experience with that. Have a great time – I hope you’ll be back to leave more comments as you travel! Hi Phyllis, I’m hoping to do the trip myself, but READ UP on PETS. Many years ago I was hoping to travel to Canada with my dog, and the information I got was that he would have to spend several days in quarantine at the border. It just wasn’t doable on the schedule I needed to keep (and I was only going to Toronto from New England). I eventually gave up on that trip. I’m actually going to try leaving Colorado in early spring, maybe taking some risks weather-wise. The description of the road as one with few services makes me think we should upgrade our tow vehicle (04 Suburban with 220K on it) before attempting the trip, just in case. It’s been a mechanical superstar the last 15 years, but for that long of a haul with so few services, we’d be better off to make this summer our Florida drive rather than try to replace a dead tow vehicle in Canada. Alaska might have to wait one more year. The Suburban is a great vehicle but I agree, I too would prefer a newer ride for this kind of trip. Ball park, how much would you budget from Portland Oregon to alaska for my daughter and I. We toad trip a lot. This would be a dream vacation. Would you ferry back? Thank you for this information. It really depends on how long the trip will be and what you plan on doing in Alaska. The ferry is pretty expensive when you board with a car but it’s not a bad option, allowing you to rest and take a break from all the driving. This really is ball park, but I would say $150 for each day you intend to spend on the way + $200 for each day in Alaska (accommodation is expensive there). There are ways to bring the prices down though, depending on how far in advance you can plan this. 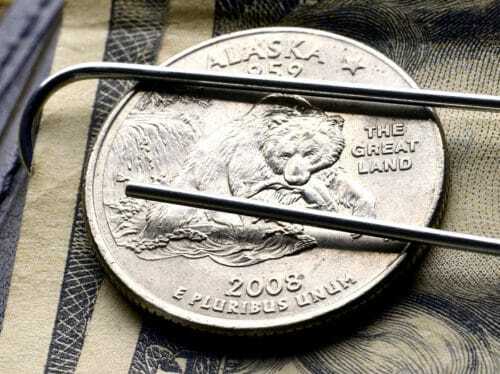 I’ve posted about the cost of a trip to Alaska here. The post includes my tips for bringing those costs down. AwEsOmE!!!! Thank you so much for this article!!! Glad you liked it! Safe travels! Yup, read the whole post. Excellent info for what has become my dream road trip/vacation. Unlikely I will ever get the wife on board, but a guy can dream! For me this reeks of the perfect trip for my brother and I to conquer before we are too old to make it. Thanks for sharing your story and insights. Best of luck on your future travels. Thank you, Jeremy! I hope you get to take that trip – it truly is a very special experience! I have a similar situation. My wife is on board then not, then on board then not. This has been my dream since high school (turning 71 in March). Did make it up there in 2010 and 2017 by flying to Anchorage for short visits. But, the draw of driving is and always will be there. Looking into taking ferry from Prince Rupert to Haines to reduce some driving and stress on my wife. I have a Grand Caravan that I want to fix up for making the trip. Good luck on making the trip. OMG this was gr8, when hubby and I decide this we will be going from Florida!! So glad you liked it, Kelley! When we started planning our trip, I actually thought about doing this from Florida and back 😀 We’ve visited 45 US states so far and still haven’t been to Florida, and I thought it would be cool to get both Florida and Alaska into the same road trip 😀 Ended up doing it from California and saving Florida for a separate trip, possibly in 2019! Thank you for your excellent blog post. We are planning to drive from Sacramento, CA to Alaska summer of 2020 and your post has given me lots of great ideas. So glad to hear that! I’m sure you’ll have a terrific time – it really is a road trip of a lifetime! I think you mean the Alaska Milepost? It’s not my book, I’m afraid but it’s the one we have used when we traveled there. Here’s the link again. Loved the article – my sister and I are planning a trip in June 2019 so we’re prepping now. I’m a teacher and she’s retired, so we don’t really have a time limit. Driving to Alaska has always been a bucket list trip for us, and we’re not getting any younger! Last year I spent 2 weeks in India, so I think I can handle it! Plus, I like to drive. Planning a trip July 2019 Los Angeles to Alaska. Curiosity what did your trip cost? I actually have a long and detailed post about this very topic! Check it out here. It includes many tips on how to lower the costs, based on our experience. Have an awesome trip! We (hubby, 6 year old, and dog) are planning a 4 week rv trip from Illinois to Alaska next summer (July 2019). We are very excited and I’m having fun researching! Your post was very helpful! I guess 4 weeks is one-way? I bet you’re going to have a wonderful time! I can’t wait to do the same in an RV too. Oh, you’re going to have such a wonderful trip! I’m researching into RV’ing too, seems like so much fun and since you can basically legally boondock in most places in Alaska, I have a feeling it can really lower the cost too. Thanks for stopping by and leaving a comment, Paul! I’m so glad you found the post helpful! If you have any questions whatsoever about driving to Alaska, just let me know. I’m sure you’ll have a fantastic road trip!